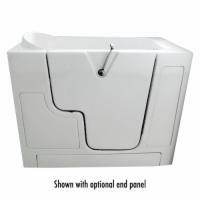 Walk-in tubs give you complete access to your tub by eliminating the need to step over the tub to enter it. How does this work? Well, every walk-in tub has a door in the side that allows you to simply walk in. This dramatically reduces the chances for falls and other accidents. 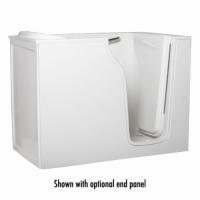 We currently carry the AmeriGlide Sanctuary walk-in tubs, which we believe offer the best quality at the best price. Convert your existing shower into a wheelchair accessible shower with this money-saving conversion kit! 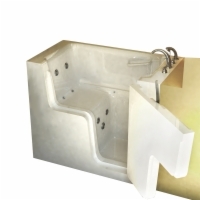 Convert your bathtub into a walk-in bathtub with this money-saving conversion kit! 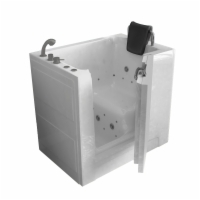 Convert your existing bathtub into a wheelchair accessible bathtub with this money-saving conversion kit! 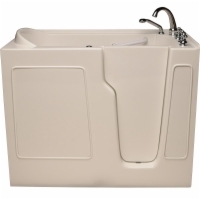 This is the most popular model in the Sanctuary Walk-In Tub line. 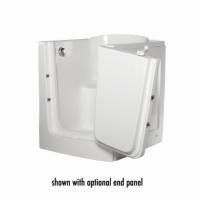 It comes in several sizes and offers a 17" high seat that meets ADA guidelines, opening it up to a wide range of users. 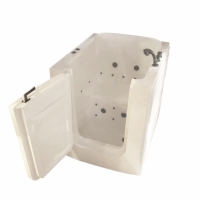 Enjoy this amazing hydrotherapy walk-in tub at a great price! 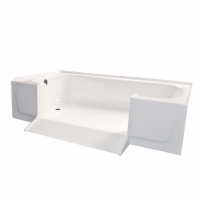 Need a walk-in tub that's also deep enough to soak in? Then you need the Sanctuary Deep Water Walk-In Tub! 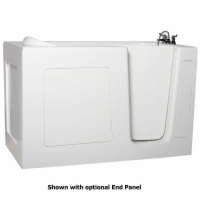 We recommend the Sanctuary King Size for our tallest users, as well as for individuals who require a full-length tub to replace their existing bathtub. 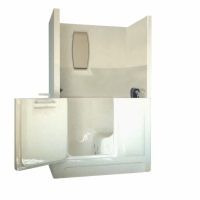 Think you can't fit a walk-in tub in your cramped apartment bathroom, mobile home, or guest house? The Sanctuary Petite Easy Soak will have you reconsidering thanks to its incredibly small footprint. 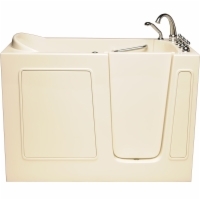 The Sanctuary Medium Duratub incorporates the features and options found on standard Sanctuary Walk-In Tubs. 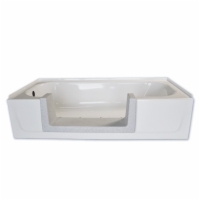 The Small Easy Soak incorporates a front facing swing-out door that makes it easy to get in and out of a tub this small. Duratubs are made from industrial grade Acrylic instead of gel-coated fiberglass. Acrylic is an even stronger material and is non-porous greatly reducing the chance of staining. Great for wheelchair users! Easily transfer from your wheelchair into the tub in no time! 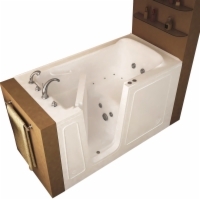 The seat is a standard 17" high so you can enjoy a warm whirlpool bath without the strain and risk of lowering yourself into a regular bathtub. For the ultimate in bath safety and personal relaxation, accept no substitutes for the Sanctuary Hydrotherapy Walk-In Tub! 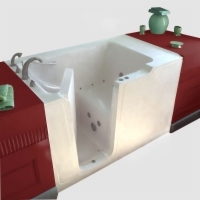 These tubs provide slide-in access to the tub due to their extra large door cutouts. This makes transfers from a wheelchair into the tub and vice versa much easier. 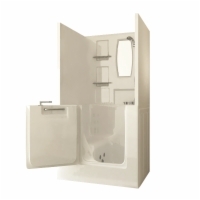 Shower Enclosure Walk-In Tubs make it easy for you to install a complete shower and walk-in tub combination unit. 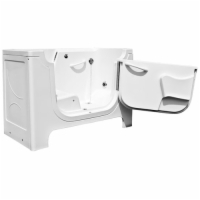 The Large Wheelchair Access Tub is a full 60" long and fits standard tub openings without any changes. In addition, it's enclosed on three sides, means it can also be installed up against a wall. 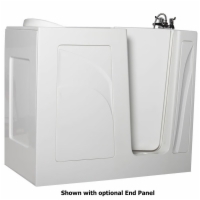 It's one of the largest walk-in tubs on the market and can be filled with up to 75 gallons of water.